A quality weld begins with a properly prepared weld environment, including the material to be welded. This is especially critical when TIG welding. Because contamination is always a concern, high quality fabrication demands attention to cleanliness not only of the base metal, but of the shop as well. The area should be free of air drafts, moisture, dust, grease and other contaminants. Joint surfaces must be smooth, clean and completely free of contamination. Use only a stainless steel brush. To prevent cross contamination, use a dedicated brush for each material you weld: stainless steel, titanium, aluminum, carbon and mild steel. This ensures the best possible results day in and day out. Remove slag produced by grinding, machining or plasma arc cutting with a file, grinder or belt sander. Clean the base metal prior to welding. It’s important that weld joints and weld rod be free of mill scale, dirt, dust, grease, oil, moisture and any other potential contaminant. Foreign substances introduced into the weld can affect the quality of the weld, and in some instances like when welding titanium, will degrade properties that titanium is prized for, such as corrosion resistance. Many fabricators use acetone or solvent as a cleaning agent. Arc-Zone.com recommends EZ Wipes™, specialized, pre-saturated lint-free fabric wipes that come in a convenient shop canister. One side is abrasive to loosen dried contaminates and the other side is smooth to reveal a cleaner polished surface. This is an acetone free cleaning agent, safe, easy to use, and can be disposed of in the regular trash. Never use a chlorine-based cleaning solvent. Weld joints should be kept covered with paper or plastic to avoid re-contamination when not being welded. Oxygen contamination is one of the most common reasons for sub-standard welds, and molten weld metal must be protected from contamination by air. Also, any heat-affected zones, and in some cases the root side of the weld, need to be shielded. Argon is the shield gas of choice for TIG welding, although in some specialty applications a combination of helium and argon is used. For thick section aluminum jobs you may benefit by adding helium which ionizes hotter than argon. A 75/25 or 50/50 Argon/Helium mix is available from your gas supplier. Always buy your gas from a trusted supplier, and make sure all the leads and fittings have been tested for leaks to ensure there is no oxygen contamination. When checking for gas leaks, it’s best to use a soap and water solution and a small acid type brush. Apply the solution liberally to the connection and watch for growing air bubbles, a sure sign of a leak. Use a high-quality TIG torch, checking all gas connections and supply hoses, ensuring there are no leaks. Also check torch insulators and o-rings for proper fit and seal. More shield gas is not always better! Increasing the flow rate can create turbulence which actually pulls oxygen into your weld zone. Set your flow meter and do some test welds on material similar to what you will be welding. This will allow you to fine tune your torch set-up and gas flow rate. Use a gas lens or gas flow straightener. In fact, I strongly suggest using these devices for every TIG welding application. They are inexpensive and easy to install. You’ll need a gas lens nozzle or cup. The lens will fit right onto the 9/20 series TIG torches. 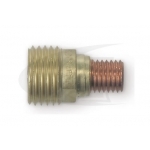 For the 18/26 series TIG torches, you’ll need an additional Teflon nozzle insulator. Whether you’re using a standard TIG nozzle, a gas lens nozzle, or a larger nozzle like the Monster™ TIG, make sure that all o-rings, gaskets, insulators and gas cups are in good working condition, and fit properly. Always buy from a trusted supplier whether you’re using original equipment manufacturer (OEM) parts or aftermarket parts. This is the best way to ensure that all the parts of your torch work together the way they are supposed to. Thoriated tungsten is often recommended for TIG welding, however, 2% Ceriated or 2% Lanthanated tungsten are good non-radioactive alternatives. Always buy your tungsten from a trusted supplier to ensure quality, and grind your tungsten on a dedicated tungsten grinder, away from your clean welding environment. Arc-Zone.com recommends the ArcTime™ brand tungsten, formulated with state-of-the-art alloys to deliver balanced migration and evaporation rates as well as outstanding ignition and re-ignition properties. In other words, it works great, and the best part is that it works for all metals, and all machines. For automated welding applications where the need to minimize variables is critical, Arc-Zone recommends pre-ground ICE-T™ formula electrodes. This tungsten has been cryogenically treated to produce a more dense grain structure for improved arc starting and electrode cycle times as much as ten times longer. Arc-Zone.com® delivers precision welding products, value-added services and technical solutions to customers worldwide. For more information, visit www.Arc-Zone.com or call, 800.944.2243 (Tollfree US) or 1.760.931.1500 (Worldwide).